One of the most frequent questions I get is “what are the ingredients in BAC?”. In this section, I will do my best to help you to understand the ingredients of BAC even though it is virtually impossible. Impossible for several reasons as you will see. Of all the nutritive substances that health science knows about, few are not contained in Bio-Algae Concentrates. At the top, BAC contains the most nutrient and phytonutrient-dense algae found on earth, selected amongst thousands of strains of algae and empirically tested for 20 years. For example, over 200 different strains of blue-green algae were investigated by the Russian reseachers to arrive at those contained in BAC. The rationale for this selection will become clear as you read on. The list of nutrients in algae, such as spirulina and chlorella, is frequently made available by the grower of these algae and in the scientific literature. The first thing you will note is that they are never the same. Anyone is welcome to make a blend of algae, and as such there are a few other blends on the market. But I urge you to consider the research involved with BAC. Like grandmother’s soup, making a blend of microalgae is both an art and a science. Either it will result in a nutritious and delicious soup or it will be a disaster if you don’t know what you are doing. BAC is hundreds of times more complex and delivers hundreds of times more nutritional benefits than grandmother’s soup. BAC is a blend of four whole microalgae (whole as in whole food), each containing thousands of nutrients, totalling over 5,000 that can be seen under the microscope or detected with the latest laboratory equipment. 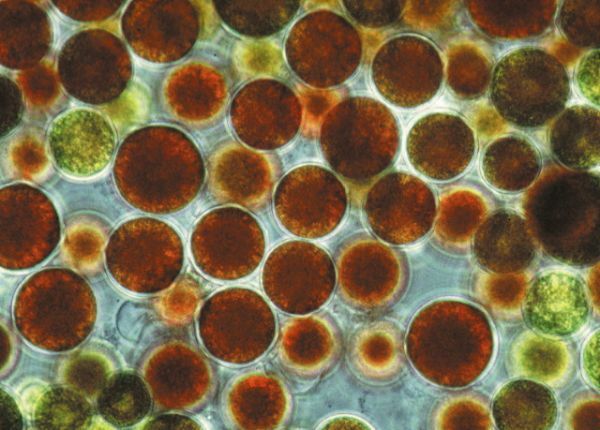 As with some fruits and vegetables, in BAC’s microalgae, there are hundreds amd possibly thousands more phytonutrients that are too small to be seen with our current microscopes and technologies, but that will be identified in the years to come. For example, only a few decades ago we identified licopene in tomatoes even though it had been present in tomatoes for thousands of years. Spirulina is a microalgae that cannot be seen by the naked eye. It is a multi-cellular blue-green algae, grown in warm and brackish water, with alkaline properties. The most well-known strain of spirulina, researched in more than 30 countries by 4,000 scientists worldwide, is Spirulina platensis. The root of “spirulina” comes from Latin, meaning helix or spiral, and it refers to the spiral shape of the cells. Spirulina is typically found in fresh or brackish water. It is composed of 60-70% protein in dry weight. Its protein elements include 18 types of amino acids, several vitamins and minerals, thousands of enzymes and several essential and non-essential fatty acids. Dunaliella salina is a single-celled, saltwater microalgae that accumulates massive amounts of carotenoids under appropriate growth conditions. It is characterized by its ability to accumulate very high concentrations of β-carotene. Concentrations of up to 14% of its dry weight have been reported (Aasen et al., 1969; Borowitzka, LJ et al., 1984). The green unicellular flagellate Dunaliella salina also accumulate very high concentrations of glycerol (Borowitzka, LJ and Brown, 1974; Borowitzka, LJ, 1981 b). Natural mixed carotenoids found in Dunaliella salina are among nature’s best antioxidants, containing a variety of carotenoids such as β-carotene, α-carotene and xanthophylls like zeaxanthin, cryptoxanthin and lutein. Natural mixed carotenoids belong to a family of naturally occurring yellow, orange and red pigments, which are also found in various fruits, cruciferous, yellow and dark green vegetables and in abundance in certain microalgae. 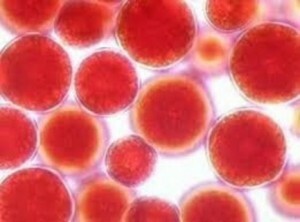 Haematococcus pluvialis is believed to be by far the world’s richest known source of astaxanthin, a unique natural carotenoid pigment and biological antioxidant. When compared with vitamin E, astaxanthin’s potency as an antioxidant ranges from approximately 80 to as much as 550 times greater. 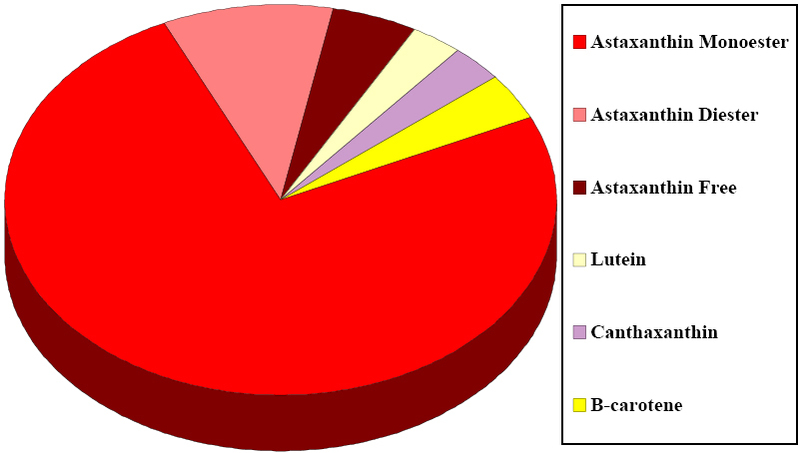 Additionally, when tested against a wide array of ROS and nitrogen-reactive species, astaxanthin appears to be the most effective in scavenging this wide variety of harmful products. Astaxanthin is known to be able to span the lipid/protein bilayer of biological membranes, imparting a powerful antioxidant effect. Haematococcus pluvialis’ combination of carotenoids yields superior potency and versatility for an ideal antioxidant. Additionally, because its astaxanthin appears to enter the central nervous system better than many other antioxidants, its utility for many disorders of the central nervous system is promising. Find next a list of the nutrients and phytonutrients of the algae that compose BAC. In the next pages you will also find a detailed list of those nutrients. High-quality complete protein that is more dense and more digestible than any animal-derived protein. (between 25% to 50% protein). All known essential and non-essential amino acids. All known vitamins: A, B complex, C, D, E and K.
All known B vitamins, including vitamin B12 (human active) which is almost never found in plants. Great for vegans and vegetarians. All known minerals and trace elements: calcium, magnesium, zinc, potassium, sodium, iron, etc. The “good fats that heal”: the essential fatty acids Omega-3 and Gamma Linoleic Acid (GLA) and the non-essential fatty acids Omega-6, Omega-9 and more. Over 4,000 enzymes critical for good health. Enzymes facilitate the breakdown of food and increase the reproduction of lacto-bacilli, the bacteria that digests our food. Mucopolysaccharides: these lipids and polysaccharides modulate the immune system and regulate blood sugar levels. Alpha and beta-carotene with antioxidant power hundreds of times more protective than vitamins E and C.
Dozens of other antioxidants in the form of mixed-carotenoids: licopene, lutein, quercitin, phycocyanin, and many more. Nucleic acids (RNA & DNA). Chlorophyll with extraordinary calcium spirulan. As with any vegetable, fruit or meat, when dealing with whole food you can never achieve the exact same nutritional values. No two tomatoes can grow with identical vitamin or mineral content; that is the way nature is. 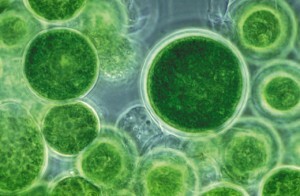 With micro marine life, such as microalgae, we have even less control of the specific ingredients. However, like most food, the values tend to be approximately 80% the same given the same growing environment. With BAC, the most advanced and rigorous algo-technologies are applied to maintain its stability, quality, continuous potency and results. As with most microalgae, BAC also contains ingredients that are too small and/or not yet identified; but as experience shows, all nutrients are important. In natural life it is rarely about quantity but frequently about quality and functionality. Over the last century we have identified hundreds of nutrients that are essential to a healthy life; Vitamin C is one example. As our technology and knowledge advances we are continually discovering new phytonutrients and their importance to life. A good example is aluminum, which was thought to be useless to life processes until recently. It is now thought to be involved in the action of enzymes such as succinic dehydrogenase and d-aminolevulinate dehydrase (involved in porphyrin synthesis). Microalge are the furthest and smallest frontier of exploration in nutrition and we will surely discover many phytonutrients contained within them in the future. In this section I will make no attempt to compare the ingredients in BAC to the Required Daily Allowances (RDA) of nutrients as suggested by the Food and Drug Administration (FDA). The main reason for this is the futility of that exercise. Like the food pyramid, which crumbled a few years ago, the RDA concept is detrimental to health. It is detrimental because it creates a false sense of security. It leads people to believe that they can be healthy by taking partial, isolated and synthetic chemicals instead of eating real bio-chemical nutrients that can only occur in food as nature made it. Mind you, if you want to play the RDA game, then BAC can easily meet most of the RDA requirements, even surpassing them and addressing hundreds that are not in the RDA tables but should be. Yet fulfilling the RDA is not the intention of BAC. BAC’s mission is “to awken the dormant genius within”. BAC is not a vitamin, a mineral, an antioxidant, an enzyme or even a supplement; BAC is all of the above. This is possible only because BAC is a whole food, but not just that, it is an extraordinary whole food. To make my point clearer about the role of BAC I will elaborate on the nutritional effiency of nutrients as they occur in whole foods as compared with nutrients occurring as isolates. I will use the critical nutrient calcium for my elaboration. In the USA, the Recommended Daily Allowance of calcium is 1-2.5 grams, while the European recommendation is 400 mg. Who is right? The RDA recommendation was based on an emerging crisis of osteoporosis, which has now reach epidemic proportions. However, the RDA for calcium has not made much of a dent into the osteoporosis crisis. The calcium supplementation industry is worth billions of dollars. There are hundreds of different kinds of calcium supplements sold with a variety of delivery options; liquid, chelated, occurring with other minerals, etc. Yet this large industry has also not made much of a dent into the epidemic of osteoporosis. It is true that our processed foods are often depleted of calcium and other minerals. It is also true that our soils are depleted of these same minerals. However, calcium is one mineral that still occurs plentifully in many foods especially when organically grown and eaten fresh. It is not difficult to eat one gram or more of calcium daily with a normal diet. Yet the epidemic of osteoporosis is ongoing. The missing factor must be calcium absorption. There are many chemical and metabolic factors that influence the absorption of calcium and the absorptive mechanism itself. The former includes substances that form insoluble complexes with calcium, such as sodium, magnesium and phosphate ions. For example, the relatively high calcium-phosphate ratio of 2.2 in human milk compared to 0.77 in cow milk may be a factor in the higher absorption of calcium from human milk than cow milk. Furthermore, intestinal calcium absorption is mainly controlled by serum concentration, hydroxylase activity and catalyses in the kidneys, which may be negatively related to the plasma calcium and phosphate concentrations and positively to the plasma parathyroid hormone. Another example of the complexity of calcium absorption is found when phytates, present in the husks of many cereals as well as in nuts, seeds, and legumes, can form insoluble calcium phytate salts in the gastrointestinal tract. Calcium taken as an isolated supplement is even harder to break down and assimilate because it is usually a metallic inorganic molecule which is much larger than its naturally occurring form in food. Our absorption metabolism and even our cell membranes cannot deal with inorganic calcium. And one wonders why we have so much osteoarthritis? Could it be that this form of inorganic calcium is not only quasi impossible to break down, but also extremely difficult to eliminate? BAC contains more naturally occurring calcium per gram than cow’s milk with high bioavailability and zero toxicity. BAC also contain calcium spirulan, a form of calcium that has extraordinary properties. In studies, calcium spirulan is shown to inhibit HIV at very low concentrations by preventing the virus from penetrating the human cell membrane and infecting the cell. In that sense, calcium spirulan is an antioxidant. In a Soviet research trial on a dairy farm with 15,000 cows, when the 2,000-pound dairy cows were fed 625mg of BAC daily (equivalent to 2-3 capsules), they ceased suffering from bone loss (osteoporosis). It is a known fact in the dairy industry that dairy cows lose their calcium to their milk because of the “unnatural” daily lactation mission and poor nutrition. Bone loss occurs gradually and peaks at around 45 months in the cows’ lactation period, at which time, because the cows can hardly “stand up”, they are usually slaughtered for meat. When taking BAC, these same cows will go on giving milk their entire lactation period of approximately 70 months without signs of severe bone loss. Now the first question usually is “Is there enough calcium in BAC for the cow’s daily requirement?”. The answer is “NO there isn’t.” But, we do know that there is “much” calcium already present in the cows body, and that there is also calcium in its daily food. So the question becomes “What prevents the cow from suffering from calcium deficiencies when consuming BAC?” The answer is that when a cow consumes BAC, its hypothalamic-pituitary complex is positively influenced by the efficently delivered nutrients in BAC. When this all mighty hypothalamic-pituitary complex is nutritionally invigorated, it “awakens” and commands via precursor hormones, hormones and peptides, billions of biochemical actions and hundreds of metabolisms, amongst those; calcium assimilation, calcium activity and calcium utilization. In essence, the cow is able to breakdown and absorb more calcium from its food, and more efficiently utilize it.